SOME OF MY formative hi-fi experiences have happened at Parmenter Sound’s HQ, located on the hill above Muriwai Beach on Auckland’s wild west coast. Jason Parmenter has always been an obliging host, happy to accommodate myself, Gary Steel and Gary Pearce on a number of occasions over the years. My initial visit to Jason’s place was back in mid-2006, when I went to listen to the first incarnation of his hand-made and rather enormous Fat Boy speakers. Hearing Hugh Masekela’s ‘Stimela’ for the first time nearly blew my mind (it was a standard Red Book CD played on an EMM Labs SACD player, as I recall), and I ordered the CD from Amazon that same day. I had a vinyl revelation on a subsequent visit when I heard Harry Belafonte’s Live At Carnegie Hall played on a Simon Yorke S7 turntable, again through the Fat Boys. These sessions got me very much addicted to realistic dynamics and a huge sense of scale in my hi-fi systems. I’ve been out there a few times over the years but it’s been almost three years since my last visit. In that time, Jason’s been busy. Back in 2001-2002, he started developing his own single ended triode (SET) power amplifiers, and he’s made a few variations on the theme over the years. In 2010, he decided to extend the concept with a pair of higher-powered but still SET monoblock power amps using the huge GM-70 output tube. In 2011, he came up with a reference preamp to match the GM-70 power amps and earlier this year, he went for a high-power push-pull pair of GM-70 monoblocks with enough grunt to drive most real world speaker loads and to control the Fat Boy’s big bass drivers with impunity. With two GM-70 tubes running a very conservative level of bias (so they should last around five years), these amps put out an easy 70 watts per side into 8 or 4 Ohms. Until you actually get a look at these tubes, you can’t really grasp just how big they are – which bodes well for the power on hand here. 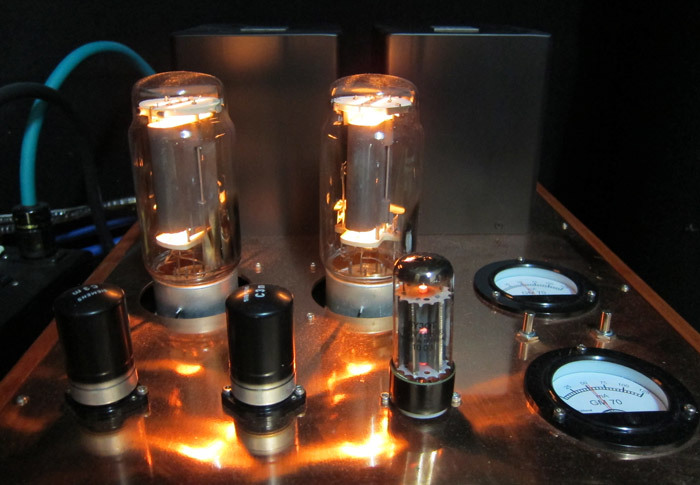 They’re glorious to look at too, featuring shiny CNC cut brass top plates, old school analogue bias meters and hand polished clear coated wood that shines in the light cast by the tubes. 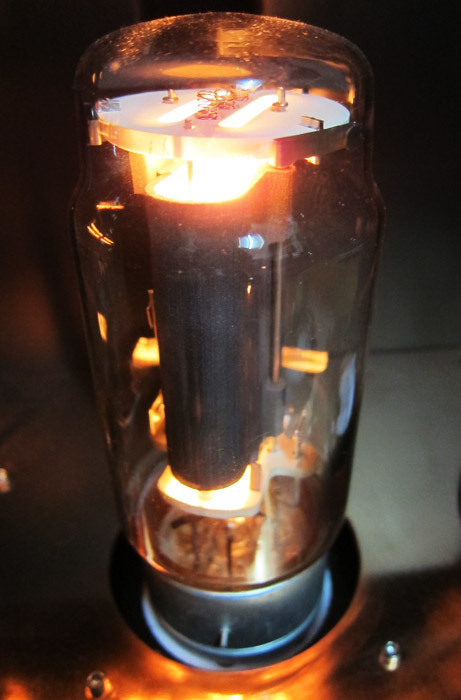 The preamp is built to the same standards. They resemble artifacts from a bygone era when form was as important as function. This is the kind of product that you own for decades, not years, and that alone has to be worth a great deal to the discerning audiophile. 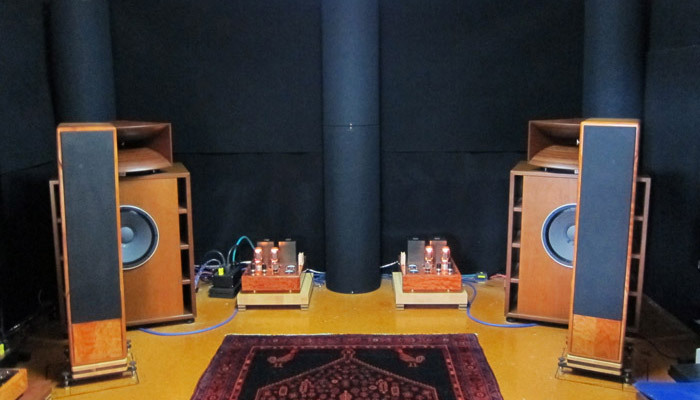 Jason’s also recently become the local and Australian agent for Daedalus Audio speakers. 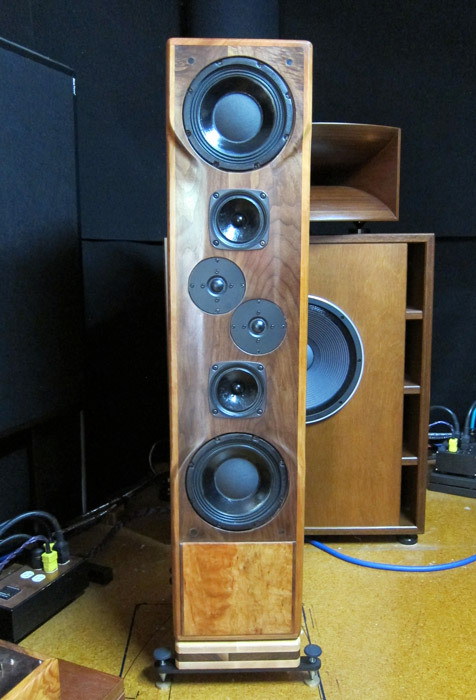 One look at the Daedalus Audio website had me very keen to shoot out west because I’m a huge fan of the warmth and quality of wood speakers. I don’t mean MDF boxes covered in a veneer (although there’s nothing wrong with that), I’m talking about speakers painstakingly crafted from solid hardwoods, and Daedalus Audio’s flagship speaker, the $23,000 Ulysses, definitely fits that bill. Something that had me intrigued was the Ulysses’ combination of world-class sensitivity without the use of horns (98 dB/1 watt) and massive power handling (600 watts). Hinkley has been making loudspeakers since he was a teenager with an emphasis on creating speakers for professional musicians. He concentrates on the “audiophile approach to acoustic amplification”; so working around issues associated with driver durability and power handling and still getting a good sound are obviously no trouble for him. The driver complement consists of two 1″ Eton soft dome tweeters, two 5″ modified Fostex midrange units and two 8″ Daedalus Audio woofers, all set up in a very unusual mirrored vertical layout, with the tweeters offset above each other in the middle of the sculpted baffle and the woofers at the bottom and top of the speaker. This model comes with the higher spec crossover option, where all the electrolytic capacitors are removed and replaced with high voltage poly and Teflon capacitors, along with the highest quality resistors, which are then all matched to the drivers. The maple bases with spiked outriggers are also included. Other specifications include a claimed frequency response of 28Hz to 22kHZ (+/- 2db) and 48kg weight. Jason’s system was set up on the day with his GM-70 power amps, reference preamp and of course the Daedalus Audio Ulysses speakers. 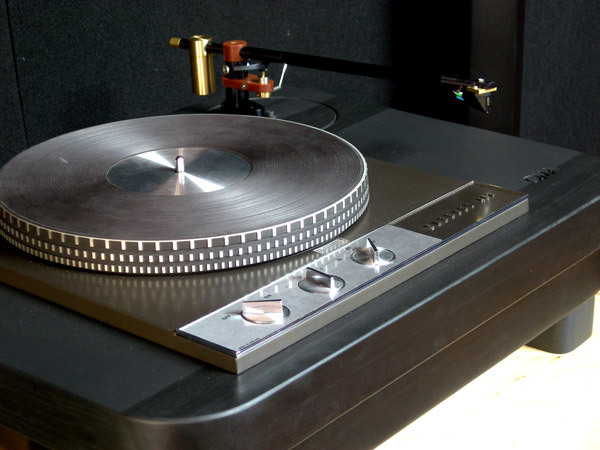 The digital source was the top of the range EMM Labs XDS1 reference SACD player ($32,000). Vinyl duties were handled by a curious combination: take a vintage but near mint edition of the legendary Garrard 401 idler drive turntable, drop it into 50+ kilograms of OMA slate plinth, add in one of the lovely 12-inch Artemis Labs Schröder TA-1L ebony tonearms and you’ve got an analogue source that fears neither man nor beast – heck, I’m not sure that a gorilla could shift this thing all that easily. 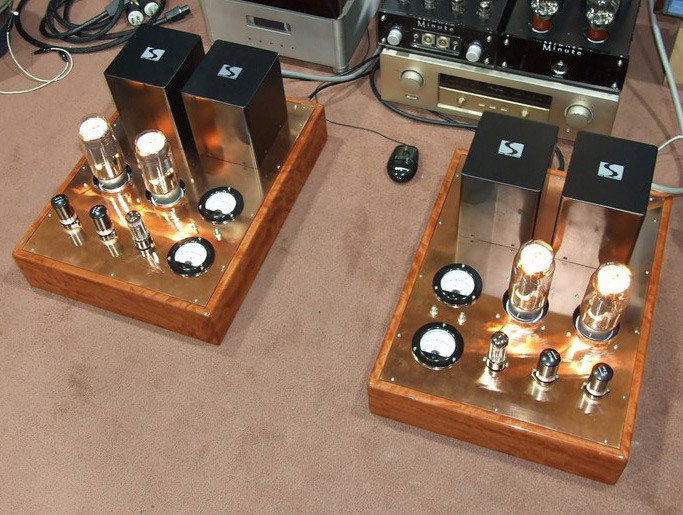 That lot ran into one of Dr. Richard Brew’s LFD Audio reference MCT-SE MC phono stages. With such an impressive deck, what cartridge did I expect to see on the end of the arm? A high-end Ortofon perhaps? Maybe a Koetsu? Lyra? Dynavector? Clearaudio? Whatever I was expecting, it wasn’t a Denon 103! Not even a 103R mind you, just a plain 103. Ye olde 103 first hit a groove back in the early 1960s and at something in the three to four hundred dollar range, you’d think the old battler would be well out of its depth in this company – more on this later. The biggest dollar item in the system, in the room, and perhaps even the suburb for that matter was the interconnect cable. PSC Audio’s flagship cable is the AG Monolith interconnect, which has a retail price of US$42,000 for a 1m pair. 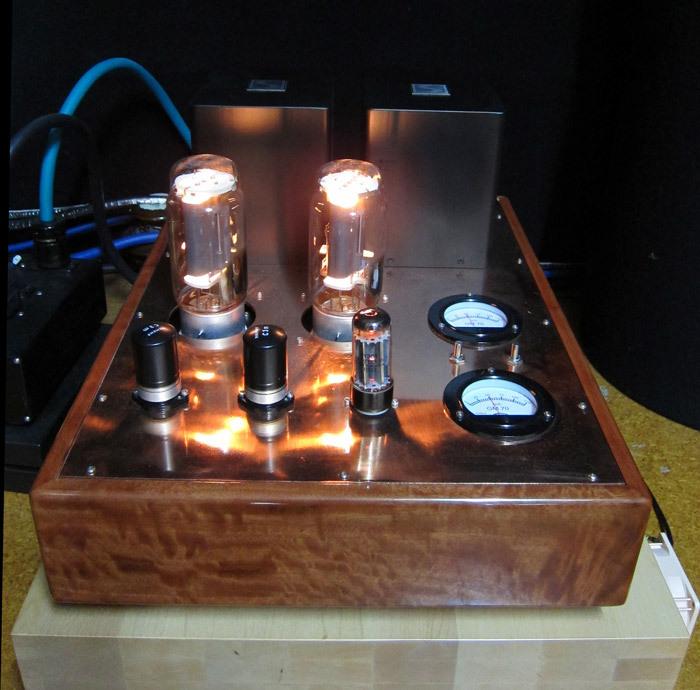 Jason has 5.5 meters running between the preamp and the power amps, plus shorter lengths in between the other components. The mind boggles, not to mention the wallet, the credit card and the bank manager. The AG Monolith is 9N silver (99.9999999% pure), annealed eight times and drawn into a single ribbon from end to end, which is shaped into the pins in the RCA connectors – there’s no solder and no joins of any sort. The silver ribbon is run in an air tube, which is surrounded by a silver-plated braided shield. The processes involved are apparently very complex, so PSC Audio only makes a few sets a year, which goes some way to explaining the price. The speaker cable was single wired Cardas Clear – by no means a humble cable but next to these interconnects, something of a cheapie (I can’t believe I just wrote that line). We listened to quite a variety of music over the hours that I was there but my first impressions of tip-top audio goodness stayed with me right to the end. The very first thing I noticed was the height, depth and realism of the soundstage. I prefer my musicians to sound as if they’re at something approximating their actual height, not like Hobbits emanating from a spot about three feet from the floor. The Ulysses speakers are tall (1.23 meters without the maple bases, which get them closer to 1.5 meters or so) and that combines with their driver layout to allow them to throw a soundstage that’s almost epic in its height, width and depth. The imaging is spectacular – there’s a real sense that you’re listening to a point source speaker system, which after all is the reason for that driver placement. Initially, the dual tweeters seem to be a strange idea but they definitely work and the system isn’t treble heavy at all. In fact, as I said to Jason more than once on the day, this system doesn’t really lend itself to surgical level sonic dissection by a hi-fi reviewer. Sure, I could have sat there and typed up pages of notes but instead, I chose to just relax and enjoy the music. We started off with a few mellow acoustic tracks by Andra, which were followed by some raw blues by Ash Grunwald. She’s a Namibian songstress, he’s an Okker. Both are quite young but they sound like they’ve been around forever in terms of their polished confidence and powerful delivery. I’d never heard of either of them before but I’ll definitely be getting hold of a couple of their CDs. On this system, their acoustic music was superbly rendered. The speakers are designed from the outset to sound natural, and they manage it without batting an eyelid. The scale of the soundstage makes it easy to imagine that there’s a full sized performer at the front of the room but the real-life dynamics, effortless headroom and power allied to an organic tonality (helped by the smoothness of the valve amps) really tie everything into a cohesive whole. He’s clearly got that down to a fine art. The warmth and resonance of the guitars and the depth of the vocals come across beautifully, with a rich tone and a deep reverberation that is dead on accurate. There’s no lack of speed here, nor are low-end impact or depth missing in action despite Hinkley electing not to plumb the very lowest depths of the bass octaves with the Ulysses (he offers the BOW (Bass Optimization Woofer) subwoofer for owners who absolutely must get down). In Jason’s big room, I’d believe every single Hertz of the claimed 28Hz (+/- 2db) frequency response – there really is a lot of weight here thanks to the twin 8-inch woofers. Even with a six-driver three-way layout, the sound is utterly coherent, even from a mere couple of meters away, which brings me back to the point source comparison and the feeling that you’re not listening to speakers but to music. There’s not much worse in audiophile terms than being acutely aware that you’re hearing a number of speaker drivers that just happen to be housed in the same box working independently of each other. Here the speakers disappear totally and the music just hangs in the room, aided no doubt by the absence of a huge hi-fi rack in the middle of the soundstage. The next CD into the EMM Labs player was Youn Sun Nah’s Voyage. The system showcased every detail in this South Korean singer’s lovely voice (man can she ever sing!) – her vocals were clear and devoid of artificial toppiness or sibilance, while the jazz band’s instruments were once again filled with depth and texture. The more I concentrated on what I was hearing, the more I noticed of the little nuances that separate a great playback system from a good one. This article is reading like a speaker review, but to a large degree, that’s what I was hearing. The EMM Labs source is an exceptionally competent player, while the amplifiers just seemed to be getting out of the way and letting the music through, and all that megabuck cable just happened to be allowing everything to connect as it should. The big tubes and beefy output transformers grip the bass drivers like a hefty set of pliers wielded by that gorilla who was trying to move the OMA plinth; there really is zero looseness at the bottom end. There’s no doubt that you’re listening to valves but the GM-70 power amps display none of the negative characteristics of valves and all of the positives. So there’s no excessive warmth, no waffle and no hiss – just a creamy natural charm, with no top end glare or any harshness, which makes CD sound very much like analogue playback. Pop a good SACD disc into the player (like the Stockfisch Records: closer to the music demo disc) and the clarity climbs to an even more stirring level. Alan Taylor’s ‘The Beat Hotel’ and Chris Jones’ ‘No Sanctuary Here’ sounded astonishing – the low notes on the latter track filling the room as if they were coming from the Fat Boys. I know that the 16-inch drivers and monster cabinets on the Fat Boys allow them to reach lower than the Daedalus Audio speakers but I could live with this level of bass extension and never once worry about what I might be missing. That top driver seems to couple to (or drive) the room in something of a unique way because the bass is really well distributed, you don’t fall into null zones or hit peaks when walking from front to back. The noise floor was something that I noticed repeatedly and remarked on more than once – even through 98dB sensitive speakers, there’s not a hint of hiss. These amps really are dead quiet except when they’re called upon to make music, a task they get to with gusto. So with acoustic music, this is a top-notch system and even based on a brief listening session, these big speakers are clearly able to stand proudly in this impressive company; they sound every inch like very high-end transducers. However, we need to be aware of a phenomenon that should probably be called something like “The Kramer Paradigm” (i.e. 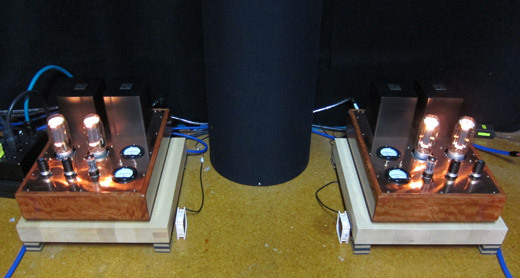 a system that reproduces acoustic music perfectly but falls apart with harder electric music.) Fortunately, that is emphatically not the case here. From the crazed eccentricity that is Lee Scratch Perry to the deep bass rumble of Optimus Gryme, this system has no trouble with loud music. The old “foot tappingly good” cliché needs to get rolled out again because this lot times to the beat like some kind of speed addled metronome. Or you could forget about the timing and just appreciate the music, which is what Jason and I did. High volume levels and huge dynamic shifts proved to be no issue for the speakers or the system as a whole. Jason says he wanted to distribute speakers that have a similar “live” sound to his big Fat Boys and the Ulysses do a great job in this regard. They’re certainly more manageable than the 200kg Fat Boys; far less intimidating too, even if they don’t exactly tick all the WAF (Wife Approval Factor) boxes as well as a set of slim, gloss black floostanders with a couple of 5-inch drivers. I know what I’d rather have, that’s for damn sure. Hang on to your slender piano gloss numbers – these real world hand-made creations would do me just fine. The limitations of the speakers or amps? The price and that’s all I can ome up with. Even then, I’m being picky, perhaps even silly. You could spend a whole lot more coin and get less pride of ownership, far less input or sweat from the makers, maybe less synergy and perhaps a more hi-fi sound (not a good thing at all). I reckon I’d find it hard to spend more money than this (assuming I had that much available in the first place). I’d go so far as to say that these speakers are some of the most enjoyable I’ve heard in absolute ages and that they’d be elevated to my top ten list, maybe even my top five. I’d love to hear what my humble Marantz/StereoKnight/Sachem combo would do with all that sensitivity and clarity. Perhaps a second trip is in order with a few boxes in the car? Hi Ash, thanks for the very positive review and for making the trip out to hear my audio system. It is always great to catch up with you and share some new music and show you some of my personal audio projects. Please feel free to come out again any time with some of your audio equipment to audition on the Daedalus Ulysses loudspeakers. Cheers Jason. Ash, over the years I have tried to manufacture to the best possible standards for the electronic internal schematic design & parts but at the top of the design criteria has always been musicality & natural tone. With this goal in mind across my Parmenter amplifier projects it has led me to select materials very carefully for the chassis, knobs & footers as these also contribute to the final outcome & sonics of the audio equipment. I think the true test for a audio system besides having to play all types of music very well from Drum & bass to Female vocals is one that makes you smile or even shed a tear from emotional enjoyment while listening to the music. When you can forget about the audio equipment and just enjoy the music you have reached what I consider to be the Nirvana of music playback. Thanks again Ash for taking the time to drive out to my place and for writing this unbiased & understanding review of what I am trying to achieve. Kind regards Jason.